I found this amazingly talented, fellow-etsyian's blog-- definitely a must see for inspiration. 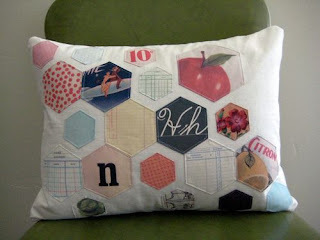 I LOVE this pillow she made-- she used scans of vintage paper (didn't want to "ruin it" or waste it" on the "wrong project" -- I completely understand what she means and feel the same way! ), printed them on printable fabric sheets, and made a pillow! WOW! I recently bought a pack of her "Duly Noted. Uncut" pack of paper on etsy. I was thrilled when I got the package in the mail-- it was a GREAT assortment of papers- new and vintage. Planning on buying another one in the near future. I decided to try making a paper version similar to her concept. I'm delighted with how it turned out and want to make a bigger one, perhaps to frame! 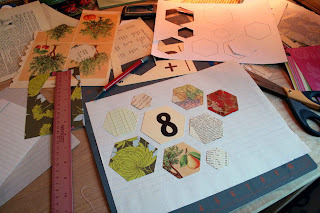 First, I used a design program (Adobe InDesign) to print out different sizes of hexagons. I then hand cut (with a metal ruler and razor blade - couldn't find my rotary cutter or I would have used that to cut several at once) each one that was placed over a piece of paper. Voila! 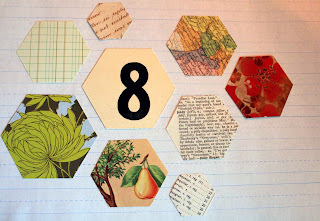 Quite simple to do with paper (fabric would be a whole lot harder), and would make a great wall hanging or gift!